Julia Rowland, Miss Florida Jr. Teen, donates supplies to Project Outreach and is featured by her local news. Julia Rowland, Miss Florida Jr. Teen donates supplies to Project Outreach and is featured by her local news. Julia donated school supplies and books to Project Outreach and attended their back to school bash. Click on the link below to see her news story. 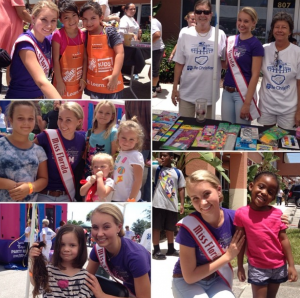 Previous Previous post: Julia Rowland, 2014 Miss Florida Junior Teen Queen, she was featured in her local news and volunteered at Project Outreach. Next Next post: Miss Kentucky Teen Natalie Lawrence raises money for the Alzheimer’s Association of America.